Acutal item may vary slightly from pictured prototype. Now you can get a true custom box to fit your Regular Cab Full Size Pickup. We have designed a really great looking, nice fitting box for this truck that can hold two 10s or 12s and has a spot to mount your amp. As you can see, this box is totally different than anything you've seen before. 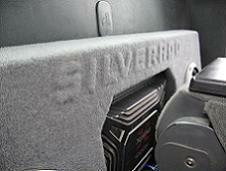 Not only that, but our box can have the optional Silverado text added at the top like the box in the photos. What is unique about this box is that the space behind and above the amp space is actually used as volume for the subs, not just a flat board like other places. 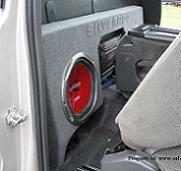 Therefore our box has increased air space that most 12s need to get loud. 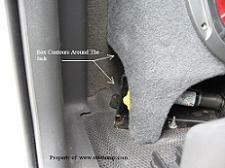 There are no modifications needed to install the box other than moving the jack handle that sits on top of the hump. The box is made to sit on the hump behind the seats and even step over the jack so you can leave it mounted in the stock location. This is not a universal dodge, ford, chevy truck box. It is made specifically for this truck and we are certain you will will love the fit and sound of this box in your regular cab. Absolutely amazing! Fits perfectly with no alterations even if you have a stationary middle seat. It sounds great! I installed two 10" P3's in this box and have an ear to ear smile. Very well built and the owner took time to answer all my questions. Want a great box this is the one for an ear to ear smile!..